A couple summers ago, Alexander Good Cane Milk was a high school dropout, working at an Arby's in South Dakota, just outside the Yankton Sioux Reservation. Life was going nowhere, and it had been that way as long as he could remember. "I just thought, you know, there's more to life to this," he said. "I can't just pay bills and die." But one day, after another shift at a dead-end job, he got a ride home from a friend who told him about Standing Rock — where thousands of people camped and protested at the end of 2016 to fight construction of the Dakota Access oil pipeline. After that conversation with his friend, Alexander Good Cane Milk quit his job, said goodbye to his girlfriend, and drove up to the protest camp, just outside the Standing Rock Sioux reservation. Living at camp and meeting people from different changed him, he said. "When you got there it was like medicine, just engulfing your whole body." He even took on a new name: Topa, the number four in the Dakota language. At Standing Rock, Topa didn't just reconnect with his culture — he also fought the pipeline. He stood on the front lines, facing the security guards and the police. He stood with members of the Crow Nation, once bitter enemies of his people, now allies in this battle. He was a warrior, he says. A water protector. "With Standing Rock, it was a spark that ignited all these fires in everybody's hearts," Topa said. Now, that fire has spread. Indigenous people are battling a pipeline in British Columbia. Others are standing up to pipelines in Louisiana and Virginia. And Topa is still fighting pipelines, in Wisconsin and Minnesota, nearly two years after Standing Rock. In this episode of Rivers of Oil, we'll take a look at why pipelines have become such a potent issue for so many Native American and indigenous people. But this isn't just a story about culture and identity. It's also a messy tale about land and treaties, and a long, complicated — and often adversarial — relationship with the U.S. government. Book: "Everything You Wanted to Know About Indians But Were Afraid to Ask" | Author and professor of Ojibwe Anton Treuer talked in this episode about the ways Native American tribes and the federal government have clashed over treaties and land. (More on both here, here and here.) His 2012 book is described as "a frank, funny, and sometimes personal tour of what's up with Indians, anyway." Treuer has written several other books, including a history of the Red Lake Nation in Minnesota. The protests at Standing Rock | MPR News covered the protests at Standing Rock in 2016, and then a year later. In an hourlong radio special, reporters dove into the protest's focus on oil, water, race and treaty rights. Now, activists are looking toward Line 3 in Minnesota: "If that permit is issued, you can be sure you will have Standing Rock in Minnesota. 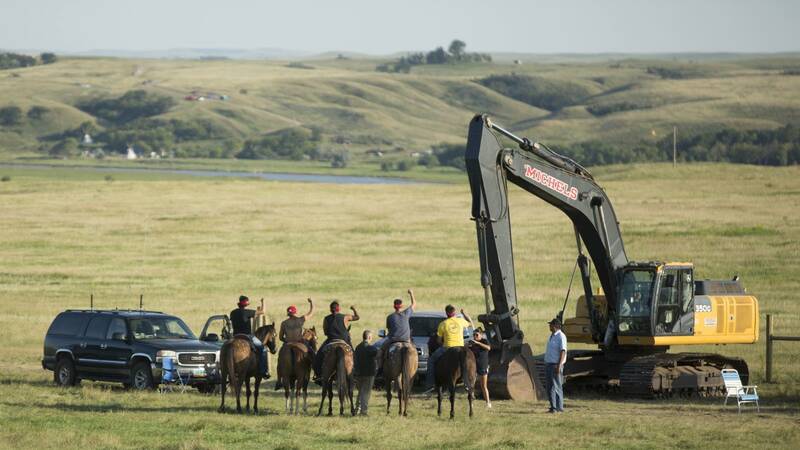 I will tell you that," White Earth tribal member and Honor the Earth executive director Winona LaDuke has said. Pipeline protests across North America | Native American and indigenous groups have been protesting pipelines across the continent, from the Trans Mountain pipeline in British Columbia to the Bayou Bridge pipelin in Louisiana and the Trans-Pecos pipeline in Texas. NPR's Code Switch dove into the history of Native American protest in the United States, calling the Standing Rock resistance "an offspring of history." Enbridge and Red Lake | The Star Tribune covered the story of Enbridge's discovery that several of its pipelines crossed a tiny piece of land owned by the Red Lake Band of Chippewa Indians: "The band ceded the parcel to the federal government in 1889. But it was never sold, so in 1945 the U.S. Department of the Interior restored the land to the tribe." Eventually, the Red Lake tribal council voted to remove the pipelines from its land. Bill Wareham is an editor for MPR News.